Two classes of methods have been developed that aim at ‘guessing’ the result of a stellar collision without resorting to an explicit hydrodynamical simulation. So far they have been applied only for MS–MS collisions. The hope is to get a semi-analytical method to get detailed prediction about the outcome of collisions (masses, velocities and stellar structure(s)) with only a tiny fraction of the computational burden of full-fledged hydrodynamical simulations. Indeed, even with a relatively low resolution (of order 10000 particles), an SPH simulation requires at least a few hours of CPU time on a standard PC. It is thus clear that incorporating ‘live’ hydrodynamics into stellar dynamical simulation is still not an option, except maybe for the slowest stellar dynamics schemes (i.e. direct N-body) and for clusters in which collisions are rare. In a pioneering work about the collisional dynamics of dense proto-galactic nuclei, Spitzer & Saslaw (1966) introduced a simple, semi-analytical model to determine the outcome (mass and energy loss) of high speed stellar collisions. This approach has been applied by David, Durisen & Cohn (1987a,1987b) and extended to unequal mass collisions by Sanders (1970) and by Murphy, Cohn & Durisen (1991). Figure taken from Murphy, Cohn & Durisen (1991). The computation preceeds as follows. The colliding stars are decomposed into a lrage number of sticks, parallel to the direction of the relative motion. It is assumed that, from the time of first contact, the collision proceeds on a straight trajectory. In the overlapping regions of the stars, one considers conservation of momentum and energy (including thermal energy) in individual encounters between one stick from the fisrt star and one stick from the other (in black on the figure). No transverse energy or momentum transfer is taken into account. If, after the collision, the total specific energy of a stick relative to its parent star is higher than the binding energy, G*M_star/R_star, this element of mass is considered lost from the parent star (of mass M_star and radius R_star). Although quite crude, this model gives results for the mass lost in surprisingly good agreement with SPH simulations when the relative velocity at infinity is larger than the stellar escape velocity and the impact parameter is relatively large, d_min>0.4*(R_1+R_2). 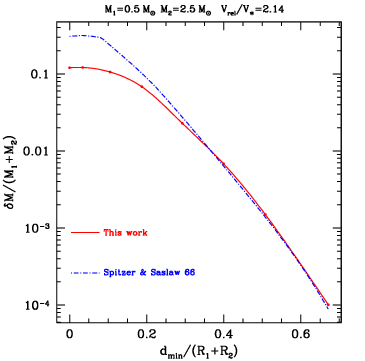 Figure: comparison of the fractional mass loss between SPH simulations by Freitag (Freitag 2000, Freitag & Benz 2002) and the Spitzer & Saslaw semi-analytical model applied to the same stellar models. This regime corresponds to most likely collisions in the centre-most parts of a galactic nucleus where a central massive black hole imposes high velocities. Future work, in particular detailed comparisons with hydrodynamical simulations, will tell us if it can be used to determine the entropy of gas elements in order to predict the post-collisional stellar structure, in conjonction with some fluid sorting algorithm, and if an extension of this method can be devised for the regime of intermediate velocities (V_rel of order of V_star) and/or small impact parameters. If the relative velocity at infinity, V_rel, is lower than the stellar escape velocity, V_star (of order 500-1000 km/s), which is the case for collisions happening in open or globular clusters, the relative velocity at contact is similar to the thermal velocity of stellar matter. Hence, such collisions are only mildly supersonic and entropy is nearly conserved. Consequently, the structure of the merger can be established by sorting the mass elements from the parent stars according to their entropy, as demonstrated by Lombardi and his collaborators (Lombardi et. al. 2002). TRIPTYCH is a computer program that simulates the collision of two stars, including the orbital trajectories, merger, and evolution of the merger product. This program is a first step toward realistic dynamical simulations of star clusters that include stellar collisions and stellar evolution. TRIPTYCH can be run online via a web interface, or you can download TRIPTYCH onto your own machine. An outgrowth of TRIPTYCH is a sister program, called TRIPLETYCH, that simulates the interaction of three stars, including the orbital trajectories, possible merger(s), and the subsequent evolution of the merger product. TRIPLETYCH can also be run online via a web interface. To start the simulation the user must choose the parent stars involved, set the velocity at infinity and impact parameter of the outer orbit, and set the semi-major axis and eccentricity of the inner orbit. All other orbital parameters are chosen at random (but the random seed may be specified to allow reproducible results). The Web interface will be expanded as the description of the underlying physics is refined.TRIPLETYCH is one star closer than its counterpart TRIPTYCH toward a realistic simulation of a star cluster. McMillan has implemented the stellar dynamics of the three parent stars in TRIPLETYCH using the scatter3 routine from STARLAB, with visualizations generated by the snap_to_image routine. Two of the stars are initially bound, with the third approaching from infinity. The scattering package is described in detail by McMillan & Hut (1996). All orbital parameters may be specified by the user; those left unset are chosen randomly from appropriate distributions. All STARLAB scattering packages (scatter3 and its higher-order generalizations) compute an encounter until it is unambiguously over—that is, two “stable” objects are receding from one another with positive velocity at infinity. A stable object is a star or merger product, or any binary or dynamically stable multiple whose components are themselves stable. Within TRIPLETYCH, the software automatically detects collisions and close encounters, classifies the dynamical state of the system, and passes all data to the stellar hydrodynamics module. Currently, the dynamical calculation is resumed (via a simple Kepler solver in the three-body case, or by reverting to the scattering package in more complex configurations) once dynamical equilibrium is restored, as determined by MMAS. Should a second collision occur, the structure of the new triple merger product is computed similarly. Once no further interactions are indicated, a stellar evolution module developed by Hurley is employed to determine the long-term evolution of the resulting object(s). The separation of functionality just described is consistent with the characteristic time scales expected for the dynamical, hydrodynamical, and stellar-evolutionary processes involved in a simple three-body scattering. However, for more complex interactions, it will probably be desirable to integrate the three modules more closely, for example using the stellar evolution interfaces defined in MODEST-1 and implemented in TRIP(LE)TYCH by Hurley, including equivalent prescriptions for the evolution of newly merged systems not yet in thermal equilibrium. The SPH method was invented in 1977 independently by Gingold & Monaghan and Lucy to study the fission of rotating (proto)stars. In 1979, it was applied to investigate the disruption of a star due to the tidal pull of a companion (Gingold & Monaghan 1979). SPH simulations of collisions between interstellar gas clouds were done in 1985 by Lattanzio et al. and, in 1986 Benz et al. considered the collision between the proto-earth and a large object to explain the origin of the moon. 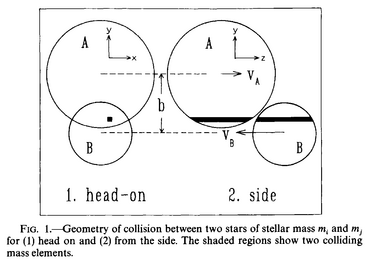 The first published SPH simulations of stellar collisions are the ones by Benz & Hills (1987). The field has since grown to a small industry and keeping track of all publications is difficult. Here is an incomplete list, organized by collision type. In this table q stands for the mass ratio M_2/M_1; other quantities are defined here. A special category is the tidal disruption of a star by a massive black hole, at the center of a galactic nucleus. See also the reference list for collision simulations with grid methods, below in this page. I have put together the files describing the initial condition and outcome of some 15,000 SPH simulations of MS-MS collisions (see Freitag & Benz 2005 and the on-line complements, a 5.2M pdf). Only simulations included in summary.txt have passed all our tests to sort out “bad” results (poor conservation of energy or angular momentum….) and select the highest resolution simulation when a collision has been simulated with various particle numbers. These (145 kB) are the initial conditions for all simulations (to be used together with stars.txt to get the stellar masses). Here you will find the basic information about stellar models (mass and radius) and name of correspond file for internal structure. The files containing the internal structure of stars can be found here. If you use any of those (except the simple polytrope models), please cite Schaller et al. (1992) , Meynet al al. (1994), Charbonnel et al. (1999). In this file you have the results in “raw” form: masses, positions and velocities of the star(s) at the end of the collision simulation. And, to finish with, here you will find a summary of initial conditions and outcomes for all collision simulations. Unfortunately, most web sites concerned with SPH seem to be a bit out-dated, with a lot of dead links. Here is an exception found so far: The on-line course on computational physics, by Franz Vesely, at the University of Vienna, features a chapter on SPH. Unfortunately the chapter seems to have broken images. Not much here for the time being, except an (incomplete) list of papers on collision simulations with grid methods. The very first simulations of stellar collisions known to us were carried out with low dimension grid codes. To increase the symmetry and decrease the effective dimensionality of the problem, head-on collision between identical MS stars where considered, quite an physically unlikely configuration (Mathis 1967, DeYoung 1968, Seidl & Cameron 1972). Since then, no grid simulation of MS-MS collision has been realized, an unfortunate fact, as this would allow useful comparison with the (quicker) SPH simulations. Most teams have concentrated on collisions involving compact objects. Here is an incomplete list of grid-based simulations, organized by collision type. 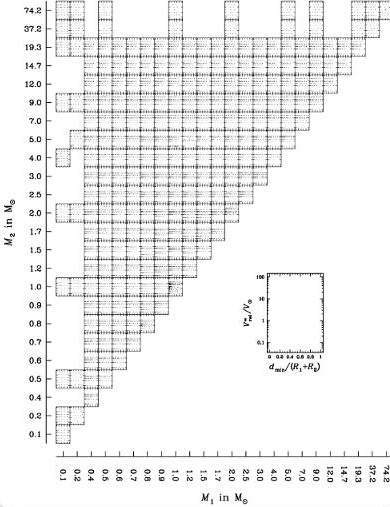 In this table q stands for the mass ratio M_2/M_1; other quantities are defined here. See also the reference list for collision simulations in this same page. Any help to develop this section very welcome…Visit also the page about NS-NS coalescence by Max Ruffert, with nice images and animations. 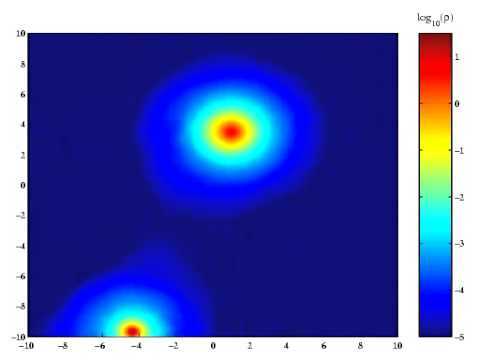 To get an idea about the activities and issues about collisions in cluster dynamics between 2003 and 2004, see the slides presented during the Modest-4 held in Geneva in Jan 2004 for this working group (coll_report_marc_freitag.pdf). You may also have a look at the list of collision-related topics discussed during this meeting (coll_discussion_modest4.pdf).